On July 8th I will have been married to my beautiful wife for seven years! We've been told that we would be lucky if we made it through our first year. We did. Next we heard that 3 years is difficult and the odds were we wouldn't make it. We did. After that it was said that 5 years was unlikely. We made it. Now we hear that after 7 years you get tired of one another and have an incredibly strong, almost overpowering desire to be with someone new. Well, we haven't gone through our seventh year (obviously as we are about to start it) but we have decided that we don't believe in the "seven year itch". Here's what we've done to make sure that the 1 year, 3 year, and 5 year milestones have gone and gone uneventfully and what we're doing to make sure that the 7 year milestone does as well. We tell each other that we love each other dozens of times a day (in fact, often to fill a silence we'll just blurt out "I love you" and the other will respond in like fashion. Sometimes we even compete to see who can say it the most in a day). We NEVER use the word "divorce." I just asked our oldest son, he's five, if he knows what divorce means. He looked at me confused and said "No, why? What does it mean?" If we don't talk about it we don't think about it. We keep an eternal perspective. We want to be together forever. No matter what happens today we want to be together tomorrow. Keeping that in mind it's much easier to get through today's troubles with our marriage intact. 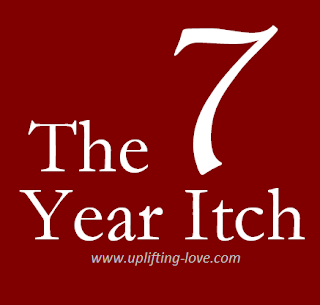 Am I worried about the 7 year itch? Nah. 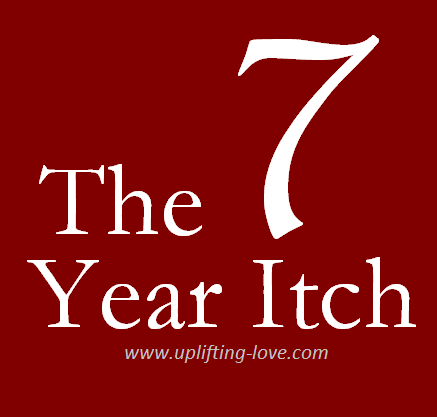 I would love to hear from those of you that have already passed the seven year mark and your experiences. Please share them in the comments! Next month we will celebrate our 29th anniversary. Our marriage just keeps getting better and better. Keep on doing what you're doing and yours will too. Thanks Anonymous! And congratulations!!! We'll keep plodding along and in another 22 years we'll still be happily married too. :) Happy anniversary! Love this! My husband and I always looked at the 7-year itch as nothing more than a Marilyn Monroe movie; pure fiction. We cruised through our 7th year and once it was over we would joke with each other, "Are you feeling itchy yet?" We have a policy that I think has helped us a great deal. We only listen to the advice of those with happier and healthier marriages than our own. That shields us from all the bad advice out there. I love your policy Fawn! That's fantastic and my wife and I are going to be incorporating that into our marriage as well. "Only listen to the advice of those with happier and healthier marriages than our own." That should go on a mantle or something. Thank you for sharing that! Thank you Krista! I appreciate the encouragement and your vote of confidence in my wife and I. I'm confident we'll make it too! My husband and I have been married almost 16 years and have never gone through an itch. We've been told we're still "in love" because we don't have children. Maybe. But with or without children, a good relationship takes work. Thanks for linking up with me at ARoomForTwoWithAView.com. You're right Melissa, a good marriage takes work. And a great marriage takes a lot of work from both the husband and the wife. The other circumstances in our lives whether it be children, money, or our health should be used as tools to strengthen our marriages. Our marriages only weaken if we let them. Thanks for stopping by! I think the reason you've made it this far is due to all that intentionality you practice in "living out your love" not just waiting for the feelings to motivate you, Tyson. I'm always inspired by your posts and am so grateful that you link them up with Wedded Wed. Even though I've been married over three times as long (25 years), I am challenged by your commitment and encouraged to "up my game" with my hubby whenever I come by here, my friend! I really appreciate your comments Beth. Your encouragement means more to me than you know. I really like the word intentionality that you used. That's a good way to describe my "strategy." We really do need to be intentional about loving our spouse. We choose to love or not to love and making marriage last, and be wonderful, requires a great deal of intentionality. Thank you! You're absolutely right Heather! Marriage is what you make it, so let's make it great! Thanks for stopping by and thank you for your comment. Great post! You sound like a wonderful husband your wife must be so lucky. I've only been married for a couple of years (3 this July) and have heard of that 7 year itch. Your post certainly gave me ideas to keep my marriage strong. Thanks! I love your post! We are on our 7th year as well but the problem with us is we are apart because my husband works overseas. Being apart is hard. Sometimes it's necessary but that doesn't make it any easier. But the fact that you are working on year seven shows that you are both committed to each other and your marriage despite the distance. Congratulations on that! Thanks for stopping by Peachy. It's been 17 years and we have never experienced anything other than wonderful.. But we never bought into what so many think about marriage: That 'marriage is 50/50', it's not.. Sometimes it 60/40 or maybe even 70/30.. What one can't do, the other can. When one has more to give, they give it.. When one needs more, they take it.. You know? We also don't believe the misconception that 'marriage is work'.. Marriage is awesome. You get to spend the rest of your life with your best friend.. Someone who means more to you than anyone else on the planet.. An extension of yourself.. That's not work for us.. We don't have to TRY to stay married and be happy.. We ARE happy.. We don't just love each other, we like each other.. Make sense? And the biggest, most important lesson we have learned is to keep others out of your marriage! When others start telling you what you should or should not put up with, when they offer advice on what 'they have observed', or begin telling you how your spouse should behave like theirs, just walk away.. Stick to your guns, stick to your spouse, and let the rest of the world do what they will.. Thanks Ren. This is great advice. I especially appreciate how you explained that you not only love each other but you like each other. I know exactly what you mean. My wife if my best friend and I would choose to be with her over anyone else every time. I rarely "hang out with the guys" because I'd rather be with her. I'm glad you've got a great marriage. Thanks for sharing your advice! All 15 of your points are excellent, especially #6. I'm glad your 7th year is not one that gives you an itch to leave your marriage behind. Thanks Gail. I'll check it out! My husband and I have just celebrated our 20th wedding anniversary - yet many of our friends who married at a similar time have not been so lucky. We found that it wasn't a 7year itch, but a 10 year one....and we had to do a LOT of talking and soul searching to get beyond it. Congratulations on 20 years! That's wonderful. I'm glad that you and your husband had the fortitude to persevere and seek the happiness that can be found in marriage. Congrats again and best wishes for the next 20 years! Good to know I'm not the only that doesn't believe it in. Thanks Dana! Congratulations! I'm glad to hear that you're still going strong! What Choices Do You Make?